While San Diego Comic-Con doesn't start in earnest until tomorrow night, fans can get an early look at the convention floor during Preview Night, where Warner Bros. has unveiled the best look yet at their Justice League villain Steppenwolf (Ciaran Hinds). Fans got their first look at this nefarious villain in a deleted scene on the Batman v Superman: Dawn of Justice Blu-ray release, but new merchandise that has been spotted on the SDCC floor has given us a full-on glimpse at Steppenwolf. If that's not enough, Warner Bros. has even brought down the actual Batmobile from Justice League, for fans to admire on the convention floor. The Steppenwolf merchandise was spotted by a Reddit user named legendofkalel, while another image was unveiled by Reddit user capebaldy7000. One of the merchandise photos only featured Steppenwolf by himself, part of a new toy line called "Batmantasfigs," while the second features Steppenwolf towering over the Justice League heroes Batman (Ben Affleck), who has some brand new Bat-armor in this image, Superman (Henry Cavill), Aquaman (Jason Momoa), The Flash (Ezra Miller), Wonder Woman (Gal Gadot) and Cyborg (Ray Fisher). Whether or not we get a closer look at Steppenwolf during the actual panel remains to be seen. 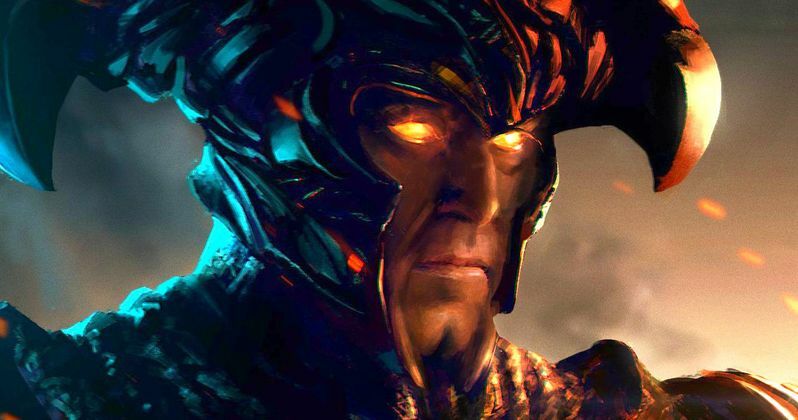 Steppenwolf actor Ciaran Hinds revealed in a recent interview that his character is, "old, tired, still trying to get out of his own enslavement to Darkseid," although he has to still "keep on this line to try and take over worlds." The actor went onto confirmed that he portrayed the character entirely through motion capture, which separated him from the rest of the cast. He claims never even met any of his cast mates in person. It's possible that he may be a surprise Justice League cast member that will be present for Warner Bros.' Hall H panel on Saturday, July 22 from 11:30 AM to 1:30 PM, joining Ben Affleck, Gal Gadot, Jason Momoa, Ezra Miller and Ray Fisher. As for the Batmobile, the high-tech vehicle was unveiled by Mattel on the SDCC exhibition floor earlier today, giving fans a chance to see this iconic vehicle up close and in person. Director Zack Snyder offered the first look at this upgraded Justice League Batmobile in March, through the social media platform Vero. As you can see in the photos below, the Batmobile has gotten quite a few weapons upgrades, which may be ultimately necessary when dealing with powerful villains like Steppenwolf and Darkseid. It was confirmed last month that Joss Whedon will not be attending the Comic-Con panel this year. The filmmaker stepped in to take over the directing duties on Justice League back in May, after director Zack Snyder jumped back so he could be with his family, after his daughter committed suicide at the age of 20. It remains to be seen if either Joss Whedon or perhaps Zack Snyder may record a video message of some kind for the fans in Hall H, but we'll find out in a few short days. Until then, take a look at these Justice League merchandise images with our best look at Steppenwolf, along with the Justice League Batmobile.